I’m obviously incredibly new to the scene-but I must admit how difficult it was for me to choose a name for this blog. Seems easy enough, but “what do you want to call it?” proved to be particularly challenging. It made me question- how on Earth do parents choose names for their children?! They have to call them that for like, ever. Anyway… Eggs, Flour, & Oil was chosen because it is simple and clean… traditional, if you will, in a world of trendy. …and due to the fact that ‘ILoveNutella.com’ was already taken. Sure- I am totally head over heels for pumpkin and would live solely off of peppermint-flavored-anything through the New Year—but would I name my blog after these seasonal superstars? Never! Modern twists are fun- but tried and true always wins in my book. I think that remains accurate for most things in [my] life. Just food for thought I guess, literally. In any case: while it’s still socially acceptable for all of us to completely lust over pumpkin-flavored-everything… I will make it a guest star of my recipe today. Classic pancakes with fall flair. Perfect. Whisk the flours, brown sugar, baking powder, salt, and pumpkin pie spice in a medium bowl. In a second small bowl, combine the pumpkin puree, milk, and egg. 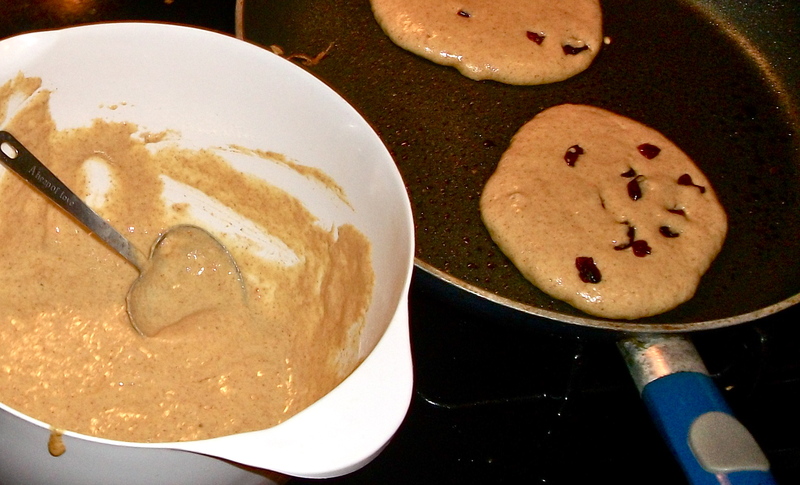 Pour the wet ingredients into the dry ingredients and stir slowly just until incorporated; do not over-mix the batter. Heat a large skillet over medium heat and coat the pan with cooking spray. 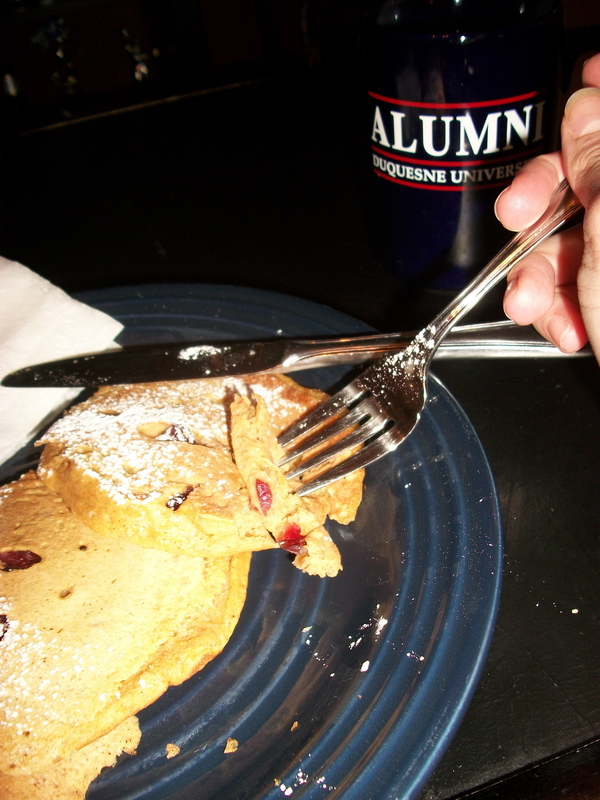 I used a 1/4 C scoop of batter for each pancake, adding a few of the dried cranberries each time to the scoop. Flip when its dry around the edges and small bubbles appear on top. (About 1.5 – 2 minutes per side.) 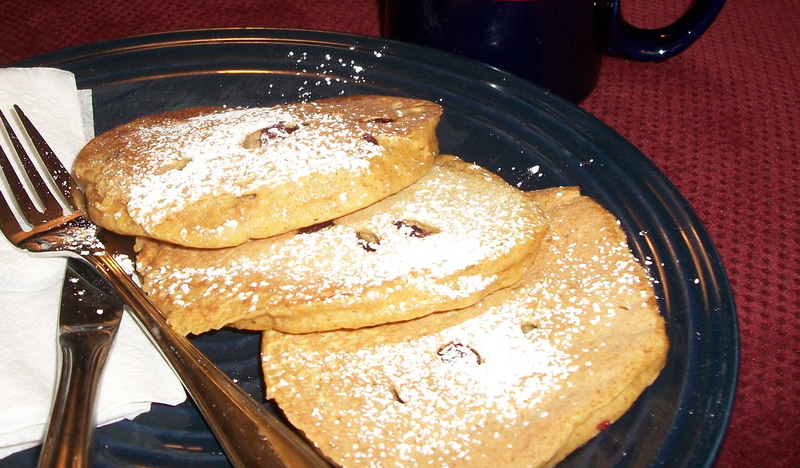 Finish with a little powdered sugar or syrup. Be patient. Don’t fuss. Make plenty for friends. Mmmm.